Finally, you can fulfill your love of great tasting coffee and Star Wars! With the R2-D2 Coffee Press, you can do it all. Adept at maintaining and repairing starships, he also has a knack for being incredibly endearing. And now, perhaps best of all, he can help make your morning coffee. 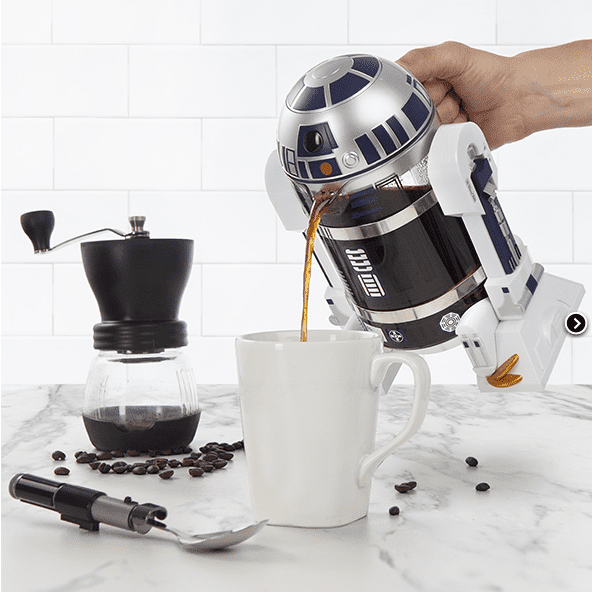 Exclusive to ThinkGeek, this new Star Wars R2-D2 Coffee Press features a glass carafe and food-grade stainless steel plunger, all encased within the BPA-free plastic housing in the shape of everyone’s favorite droid. In addition to being—let’s face it—delightfully charming in appearance, this coffee press boasts ease of use and effortless cleanup. Its lightweight and compact design, paired with an affordable price, makes this little droid a great way to get your caffeine fix while getting your geek on. It might just be the droid you’re looking for. We know you’re dying to know. 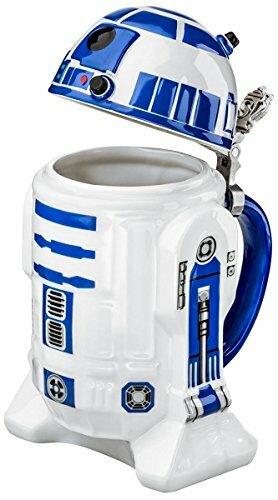 Yes, there’s also an R2-D2 coffee mug. Like other coffee presses, this coffee-making droid requires the coffee beans to be ground more coarsely than a drip coffee maker. The water used should also be a bit hotter. Place your coffee grounds and hot water in the glass carafe and allow to brew for two to four minutes—a little longer if you like your coffee on the Dark Side. Then plunge and pour. A full carafe will give you 32 oz of hot coffee. If you’ve never used a coffee press before, you’ll be delighted by how simple the coffee-making process is. There are no settings to program, no water filters to replace, and no descaling regimens. The removable glass carafe is dishwasher safe which means you’ll have Artoo cleaned up and ready for his next coffee-making mission in no time. 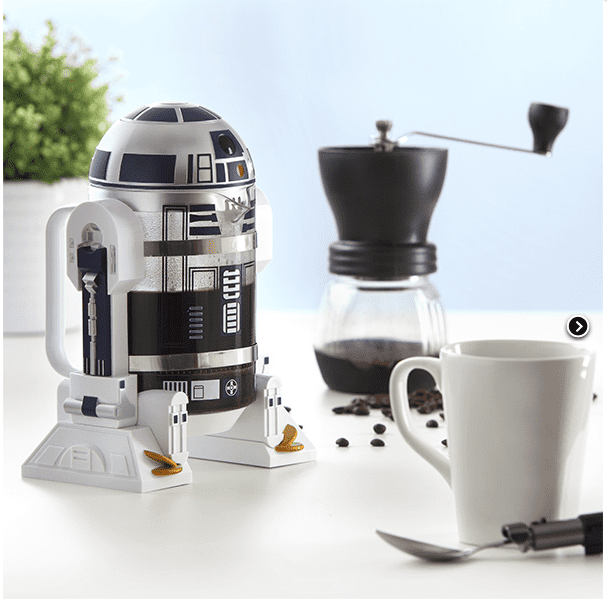 The Star Wars R2-D2 Coffee Press is not yet available. It can be preordered exclusively at www.thinkgeek.com and will ship late 2016, early 2017 so it might not be available for Christmas. As a result, there are no user reviews available on this item. It is important to note that ThinkGeek only ships the coffee press to the U.S. and Canada. If you drink a lot of coffee, or if you are making coffee for several people, the 32 oz capacity might be too small. That’s only about four cups. This is not an electric appliance and, as such, is extremely basic and uncomplicated. This might be a source of disappointment if you are a lover of high-tech gadgetry, or expect R2-D2 to companion you on a mission. It’s a fun way to get your morning java though! It looks like R2-D2! Need we say more? Of course, at $39.99, the affordable price is also a plus. A great perk to using a coffee press is that cleanup is a breeze. The glass carafe can be removed from the BPA-free plastic housing and is dishwasher safe. Because it is small and lightweight, this coffee press is very portable and can easily be moved from countertop to table. Its design is simple and uncomplicated, making it a cinch to use, especially for those coffee lovers who don’t want lots of bells and whistles when making their morning cup of joe. Selecting a brew time is left up to the user; just keep an eye on the clock and press the plunger when ready. And with no electronic components, there is no risk of a malfunction, which might be more than we can say for the real Artoo! Ease of use, compact design, and an affordable price make the Star Wars R2-D2 Coffee Press a great choice for any caffeinated Star Wars fan. This Star Wars R2-D2 Mug is the perfect companion to the R2-D2 Coffee Press. This officially-licensed piece of Star Wars merchandise is 4” in diameter and stands 6.5” tall including Artoo’s clever lid which will help keep your brew piping hot. This cup is made of strong porcelain and holds up well to washes and use. This version is a collector item, that includes a hinge so you might want to avoid putting it in the dishwasher. We suggest using it every day for an enjoyable, out-of-this-world coffee drinking experience, and just hand-washing it. 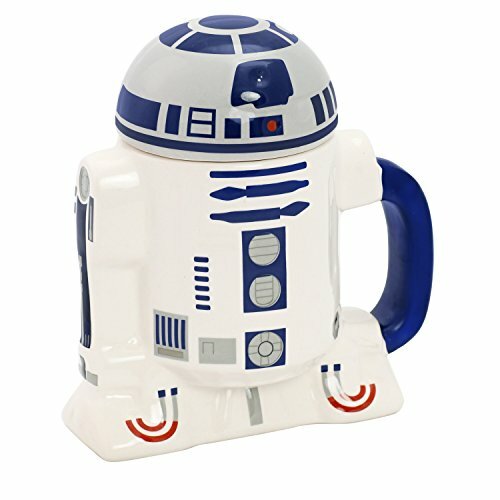 There’s also another version of the R2-D2 mug that includes a removable lid. 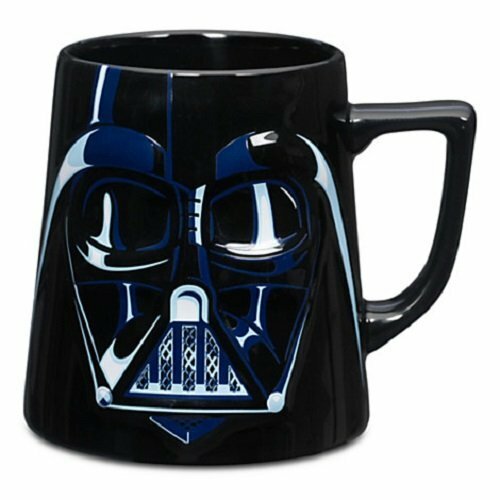 If you want to join the dark side (maybe with some dark brew), why not get this Darth Vader Large Ceramic Mug to add to your collection? It’s also made with a strong porcelain, and holds up to 16 oz of coffee goodness, or should we say darkness? We recommend washing by hand, but this will hold up to many washes, and lots of galactic battles.